Nowadays, I sync all my social media together, and I have reached another milestone. I have found recently that the number of followers on my Instagram account has passed 50,000. Thanks to all the friends who like my art. I did another small sunflower painting. It happened that my son Jonathan was home. He made a time-lapse video for me. I have upload this video on Youtube. Please click: Sunflower time-lapse to watch. Finally, I start to post my 2018 workshop demo images. I have done two workshop teaching so far for the year. This one is my first demo in Sacramento CA. February is the time I paint a few individual flowers. I hope I can progress a little every year. This winter is cold, very cold. In addition, according to Phil the Groundhog, we will have 6 more weeks of this cold winter. Well my fellow artist friends, should we go to Florida? Paint a few palm trees and practice your understanding may be a warm idea. In February, I will teach two landscape painting workshops: Ft. Lauderdale (2/20-22) and Ponte Vedra Beach (2/24-27). So far we still have a few openings at Ponte Vedra Beach. Please visit: Cultural Center at Ponte Vedra Beach for detailed info and sign up. 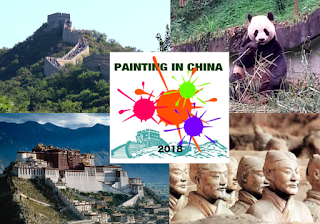 I am very excited to announce our "Painting in China 2018" trip is ready for registration. From September 6 to 21, we will spend 16 days together in China. We will climb the Great Wall, and visit the Forbidden City in Beijing, see the Terra-Cotta Warriors in Xian, play with the adorable giant pandas in Sichuan Provence, and the most special, we will visit the mysterious and legendary land of Tibet. During the trip, we will have 6 painting events. I will share my oil painting approaches.You may get the general information about this trip on my website: http://www.qh-art.com/china-2018.html, and send your request by email: goodart898@gmail.com. We will provide detail information about registration and preparation for the trip, and answering all the questions you have. This is a very special program. Please join us.